17th Century Embroidered Jacket – Worth Looking at Up Close! 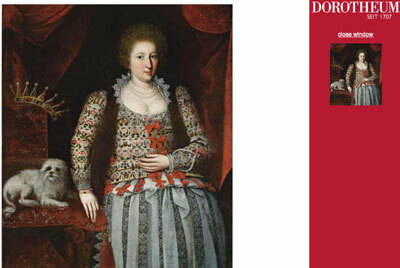 On the website for the Dorotheum auction house, there’s a gorgeous portrait of a lady (identified as possibly Anne of Denmark, who was the wife of James I), in a gorgeous 17th century embroidered jacket. The embroidered jacket featured in the portrait is a little different from the ones we’ve seen resurrected lately in all kinds of costume & textile history books, as well as in the “Plymoth Jacket” re-creation project. This one has a much more rigid design to it – not a lot of visible scrolly vines and the like – but nevertheless, it’s a beautiful example of 17th century Clothing for the Rich and Famous. While you’re there, don’t limit yourself to the portrait. Take some time to read the history of it, too. It’s fascinating! The specialist who writes about the portrait, Dr. Mark MacDonnell, presents some wonderful insights about the subject of the portrait, the various elements in the portrait and why they are significant, and an interesting tidbit on the wardrobes of Elizabeth I and Anne of Denmark. I love the fact that the jacket is referred to as “increasingly archaic” in style. And yet, here we are, 400 years later, still gawking at the things in wonder. When you go to the Dorotheum site and zoom in on the jacket in the portrait, you’ll see that the pattern of the jacket features lots of small elements connecting with interlocking gold circles. The individual elements are worth taking a look at, if you’ve got any interest in 17th century embroidery and are looking for design ideas. There are some nice little motifs in there! Perhaps not as noticeable to those enamored with 17th century embroidered items, but just as interesting, is the gown underneath – zoom in on that, too! The strips of lace are Italian reticella. If you’d like to know a bit more about reticella lace, you should check out this PDF on the history and techniques of reticella lace, from BayRose. If this is your Needlework Cup of Tea, do go see the portrait up close on the Dorotheum website. If you click on “full size picture” under the portrait, you will have the option of a high resolution image download, too. Do it today – you never know how long the image will be available on the site, as the auction ended in April. Thanks for the link! Fascinating reading. A year’s worth of work just trying to replicate some of the patterns! Thank you Mary. I am particularly intigued by the white work around her neckline. It almost looks like it is drawn in on the picture,and the Italian lace is beautiful. I though at first that it might be blackwork until I took a closer look. Love the lace collar. Fun to see how royalty dressed. Fantastic source material, Mary! I love the structure with the interlocking gold rings. One could do a number of interesting things with that! Intriguing and beautiful. Thank you. Cheers, Kath. ooh…thank you Mary for the link. I’m taking Tricia Nyguen’s casket class and have been immersing myself in 17th century imagery for days now. The gold work on the chair upholstery in the portrait is almost as interesting as the florals in the jacket. On a side note, I just discovered a relatively new spam free search engine called ‘blekko’…amazing diversity of images that I have not seen on other search engine sites. My endorsement sounds like an ad almost, but I’m not connected with the site in any way. 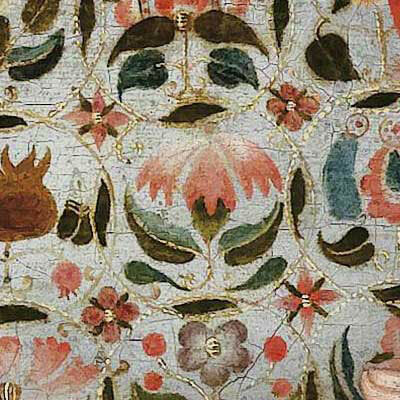 I just was blown away with the variety of new images to see when I typed it – 17th century embroidery. Beautiful motifs. Your knowledge about all things needlework continues to amaze me, Mary. Thank you for this, Mary. It is a delightful portrait as well as giving us some gorgeous eye candy embroidery and stuff to look at. Like another of your correspondents I thought the goldwork on the stool or chair under the dog was just as interesting as her garments. Mostly because of your work and the wonders you show to us, my interest in historical styles of embroidery and other needlework has grown enormously. Thank you, Mary. At first it seemed that each sleeve at the wrist was different. Now I’m wondering if that is a pearl bracelet or a string of pearls wrapped around her wrist. I also noticed what looks to be embroidery on the seat and back of the chair/throne? The artist painted the light reflecting off the embroidery. Do you think that would be silk and/or metal threads? I keep looking at the lace on the skirt. In some places it looks like the artist actually painted the individual threads (especially on the very left hand edge near the tassel on the chair)! Thank You for sharing this painting. It’s lovely!! I have recently found this blog – but find that I am too late to download the high-res image. Is it possible to get a copy from somewhere else? I have been working on creating my own 17th century sampler, using period design sources, and have been totally caught up in this era of historic stitching. Next Next post: Silk & Goldwork Embroidered Medallion – Finished!